The Congress of Racial Equality (CORE) established a reputation as one of the most important civil rights organisations of the early 1960s. In the wake of the southern student sit-ins, CORE created new chapters all over the country, including one in Brooklyn, New York, which quickly established itself as one of the most audacious and dynamic chapters in the nation. In Fighting Jim Crow in the County of Kings, historian Brian Purnell explores the chapter's numerous direct-action protest campaigns for economic justice and social equality. The group's tactics evolved from pickets and sit-ins for jobs and housing to more dramatic action, such as dumping trash on the steps of Borough Hall to protest inadequate garbage collection. The Brooklyn chapter's lengthy record of activism, however, yielded only modest progress. Its members eventually resorted to desperate measures, such as targeting the opening day of the 1964 World's Fair with a traffic-snarling ""stall-in."" After that moment, its interracial, nonviolent phase was effectively over. By 1966, the group was more aligned with the black power movement, and a new Brooklyn CORE emerged. Drawing from archival sources and interviews with individuals directly involved in the chapter, Purnell explores how people from diverse backgrounds joined together, solved internal problems, and earned one another's trust before eventually becoming disillusioned and frustrated. 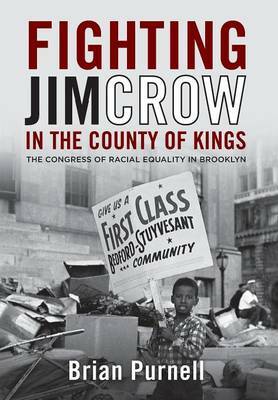 Fighting Jim Crow in the County of Kings adds to our understanding of the broader civil rights movement by examining how it was implemented in an iconic northern city, where interracial activists mounted a heroic struggle against powerful local forms of racism.